On the day that we are celebrating America's Independence I figured no dessert could be more appropriate than Apple Pie! It's no wonder why this pie is one of America's most favorite and maybe most patriotic dessert. The combination of crunchy, sweet apples, with spicy cinnamon and of course a crispy crust will melt your heart instantly. With it being the Fourth of July, I couldn't just make any ole Apple Pie, I had to go all out. 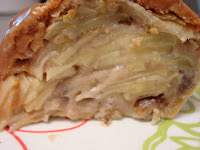 I remembered a few month's ago seeing this amazing Apple Pie on a Food Network show, and immediately knew this would be the perfect Birthday Pie for my beloved country. The original recipe is an enormous "Savannah High" Apple Pie, which calls for 24, yes 24, apples...I decided to half it and use 12. 12 crispy green Granny Smith apples still turned out to be a lot, especially when you're finely slicing the apples instead of just making chucks. But the end effect was to die for. You see, with this recipe you slice the apples very thin, then stack them in layers creating a really tall, really packed apple pie. 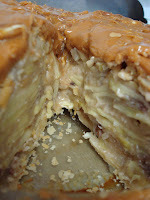 And did I mention there's streusel layers in between apple layers? You heard right bloggers! Then you top the whole pie of with a layer of crust, which after its baked, gets a layer of sticky, gooey caramel pecan topping. I can't begin to tell you how good this pie was! I can't wait to enjoy this pie with a big scoop of vanilla ice cream while we watch fireworks burst up above to commemorate this beautiful country and all it has to offer! And to all of those who have fought so hard to keep providing Americans with the independence, freedom and glory that we treasure I can't thank you enough! Happy Birthday America!!! Love your blog! I am visiting today via the foodie blog roll. Happy July 4th! Happy 4th -- love your pie! That's one patriotic pie. 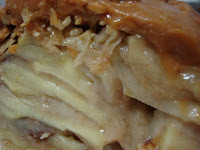 I love the look of the filling-it looks perfectly juicy.